Gerald B. Mentor has authored/co-authored at least 1 Book(s) base on or surrounding serial killers. Serial Killers mentioned by this author include Ramon Escobar. 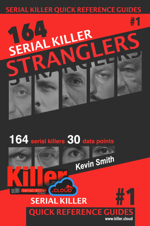 Gerald B. Mentor has 1 Book(s) listed on Killer.Cloud used for the purpose of documenting facts about Serial Killers listed in our database. Publishers include Page Publishing Inc, The publisher(s) and author(s) listed hold all rights related to the property of work and/or the property's copyright. The below books were authored or co-authored by Gerald B. Mentor.